If you were entertained and fascinated with Puss in Boots addition to the Shrek Series, you'll surely love more his character in this fantastic visual sparkle of charm and humor that even dog owners will surely love to watch. 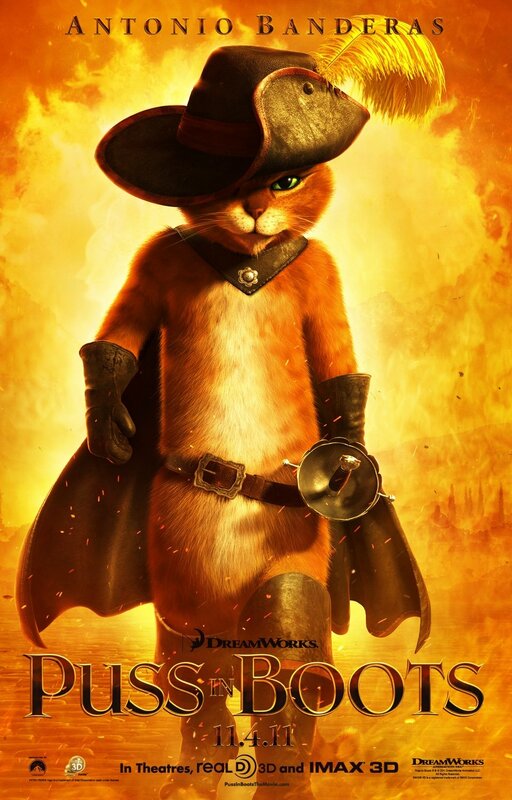 Puss in Boots is not as outstanding as other Animated Films but it will surely entertain audiences of all ages. I really love cats and this movie made me even love cats more. What is charming and great about this movie is that it focuses on the history and journey of Puss in Boots before he met Shrek. The movie started with the premise on how Puss got his boots and even the history of his childhood. Puss' childhood became colorful and adventurous when he met Humpty Dumpty. Puss and Humpty were one of the adopted or orpahns of a very good lady, Imelda, which later became their foster mother. Puss and Humpty's friendship grew stronger as they both fulfill their dreams of finding the magic beans that will lead them to the Castle above the skies where they could find the Golden Goose that poops gold. But their friendship and quest was tested with Trust on a night the will changed their lives forever. Years later, Puss in Boots and Humpty Dumpty met again. This time, with the help of Kitty. They worked altogether to get the Magic Beans to the wicked couple JACK AND JILL. The story is very visually appealing and the plot is good. The premise of the movie is clear. It gave a detailed history of how Puss in Boots became a legend. I love how the director played with storyline as it involved Famous Fairy tale and Fictional Characters such as HUMPTY DUMPTY, JACK AND THE BEANSTALK, JACK AND JILL, THE GOLDEN GOOSE and many more. And of course, there are so many cats in this film that made the story cute and very appealing to cat lovers and even audiences of all ages. You'll be mesmerized with the Spanish-inspired accent and aura of Puss. There are many exciting and fascinating moments to watch out for this film. Of course, the star-studded voices behind the characters made it even more fabulous. I couldn't think of any other Hollywood Actor other than Antonio Banderas that could fit the voice behind the legendary Puss in Boots. Salma Hayek was also as beautiful as her voice behind Kitty, the love interest of Puss in the film. What I love most about Puss in Boots is its impressive use of the 3D technology. I am very much pleased on how the Technical Team of the film maximized the technology. Actually, Puss in Boots is full-length 3D film. The 3D stuff is not only on selected scenes but almost all part of the movie. It feels like you are inside the movie. I really think it is one of the Animated Films that is really worth-watching with those three-dimensional glasses. It's solid entertainment from start to finish, with enough adventurous moments to delight most viewers are just enough reasons why you should watch this film. I must say, PUSS IN BOOTS 3D is still one of the most charming Animated film of all time and one of the films that has the best use of the 3D technology.